I love the sound of my home stereo, so I'm not looking for a complete receiver overhaul. Denon HEOS Link - Connects to your existing receiver or amp and adds wireless music. Denon HEOS Link - You can connect a TV, disc player, or turntable and send sound to HEOS speakers or components in other rooms. I love the sound of my home stereo, so I'm not looking for a complete receiver overhaul. But, man, would I love the convenience of wireless music. Denon offers a quick and easy solution to this type of dilemma. The Denon HEOS Link connects to your current receiver or amplifier and gives you wireless access to all your music. The HEOS Link features flexible inputs and outputs. 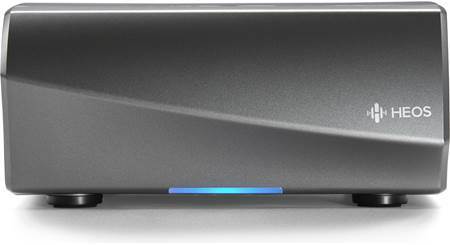 This second-generation version of the HEOS Link lets you stream music via Wi-Fi or Bluetooth. And when you download the HEOS app for Apple®, Android®, or Kindle Fire, you can queue up and control music selections, both on the HEOS Link and on all other HEOS speakers and components you add throughout your home. The HEOS app puts an incredible amount at your fingertips. You have access to music stored on your smartphone or tablet, plus downloads found on a server or computer. That includes your high-resolution music files. Want to listen to audio from YouTube? Or maybe you have a new music service not yet available through HEOS? The latest generation of HEOS has you covered. Use Bluetooth to stream any and all audio sources from your phone or tablet through the HEOS Link, without restrictions. You can also send that Bluetooth stream to other HEOS speakers. The HEOS app lets you choose one song for your stereo with the HEOS Link, and something completely different on other HEOS speakers elsewhere. Or you can group HEOS speakers together and have the same tunesplaying throughout several rooms. Have first-generation HEOS gear? All HEOS components are still compatible, so you can mix and match. 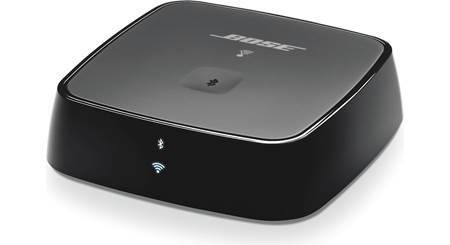 You can connect a TV, disc player, or cable box and send sound to HEOS speakers or components in other rooms. The HEOS Link can take control of Denon and Marantz receivers (sold after 2010) that are on your home network. The receiver will automatically power on and switch to the HEOS Link's input when you've selected it though the HEOS app. You can adjust the volume wirelessly, right from your mobile device. 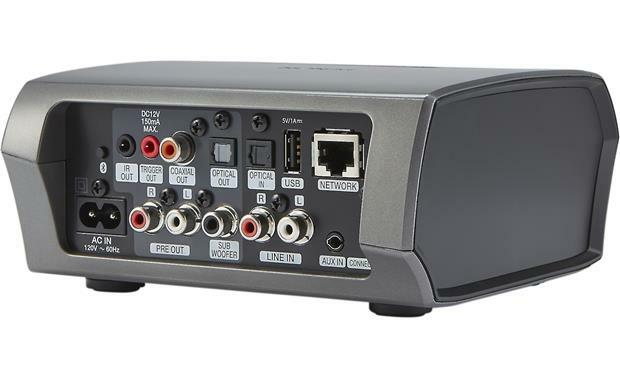 The HEOS Link has analog and digital connections for other audio sources like a disc player, cable or satellite box, portable music player, or streaming media device. You can send music from any of these connected sources to other HEOS speakers and components. One reason people loved the first generation of HEOS was because setup was fast and easy. Denon hasn't changed that a bit with the their latest series. An included setup cable connects your smartphone or tablet to the HEOS Link. 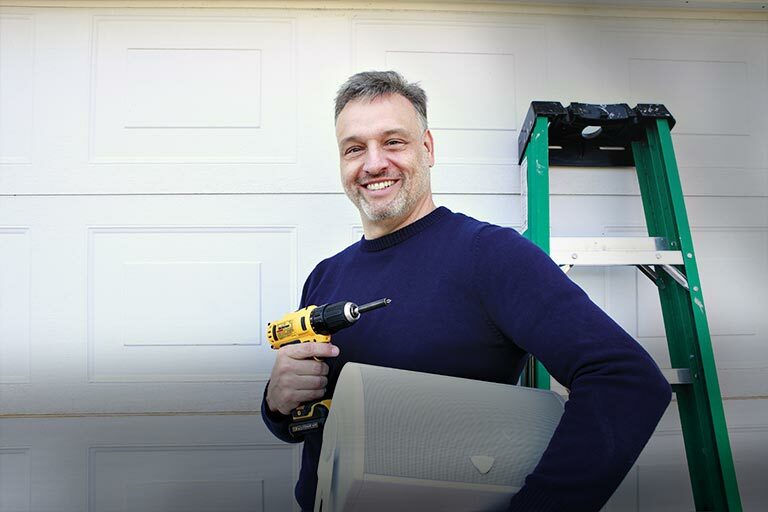 With a few taps of the app, your Wi-Fi settings are automatically transferred. When you unplug the cable, you'll have full wireless control of the HEOS Link. I want to add HEOS to my whole house Xantech audio system. Would the Heos Link or the dnp-800 be a better product for that? HEOS Wireless Multi-Room Sound: The HEOS Link (HS2) is part of the HEOS wireless multiroom, high resolution audio system. 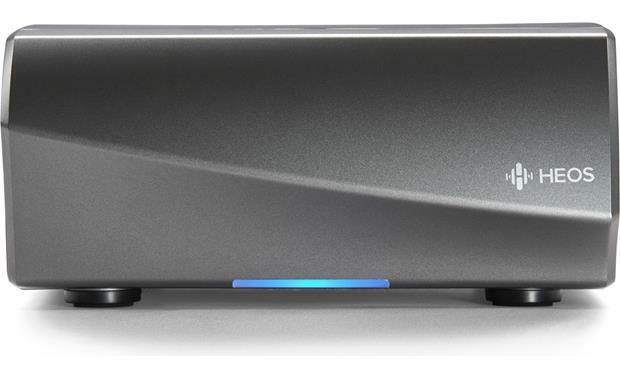 HEOS is a wireless multi-room sound system comprising a family of network music amplifiers, pre-amplifiers, and speakers for your whole home. There is a free app to control them from your iOS or Android phone or tablet. You can enjoy your favorite streaming music services, internet radio, or your own music collection. Plus, set-up is intuitive and simple. To Make HEOS work in your home, you'll need..
Wireless Pre-Amplifier with Analog & Digital Outputs: The HEOS Link (HS2) adds HEOS multiroom audio functionality to virtually any existing home audio or powered speaker system. 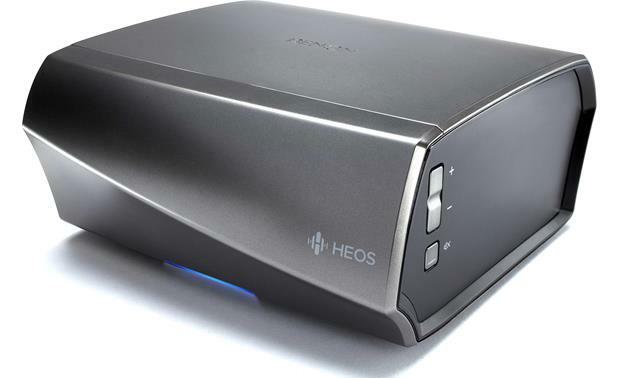 The HEOS Link (HS2) connects to your home audio system via its stereo RCA pre-amp outputs or optical and coaxial digital outputs. The analog output can be set to fixed or variable. The optical & digital outputs support 2-channel, 32-192kHz, 16/20/24-bit audio. 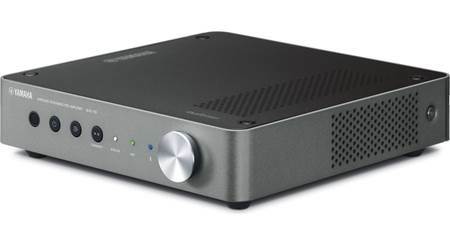 The Link pre-amplifier also includes a mono-RCA sub output to connect a powered subwoofer. Wired or Wireless Network Connectivity: The HEOS system uses your home's wireless (WiFi) network for whole-house audio entertainment. The HEOS Link (HS2) can connect to your home's network via Ethernet (RJ-45) or WiFi (802.11 a/b/g/n/ac). At least a dual-band (2.4/5GHZ) "N" router is recommended for the most reliable wireless network connection. The free HEOS app for Apple iOS and Android is used for wireless (WiFi) setup with your home's network. Wired Setup: Simply connect the HEOS Link (HS2) pre-amplifier to your home network using an Ethernet cable and the pre-amplifier will appear on the HEOS app on your Apple iOS or Android device as a new room in the Rooms screen. Wireless Setup: Use the HEOS app on your mobile device and the included minijack cable to connect the HEOS Link (HS2) wirelessly to your home's WiFi network. During setup, you will need to connect the included minijack cable to the headphone jack of your mobile device and the Aux input of the HEOS Link (HS2). The app will then copy your mobile device's wireless network settings over to the pre-amp via the connected cable. You can add additional wireless amplifiers/speakers to the HEOS system by selecting "Add Device" from the HEOS app's settings menu. 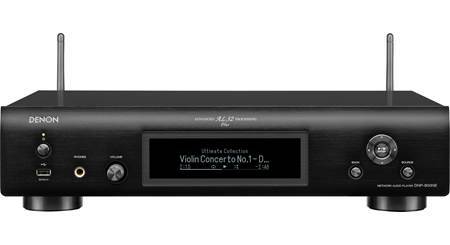 Note: The only controls that are physically located on the HEOS Link (HS2) pre-amplifier are Volume Up/Down and Mute. Multi-Room Configuration: Combing the HEOS Link (HS2) with other HEOS wireless music amplifiers and speakers (sold separately), you can configure a true wireless multi-room sound system in your home. You can play the same song in every room or any combination of rooms you choose, including a different song in every room. The HEOS wireless audio system automatically synchronizes audio playback between multiple speakers so that the audio coming from different rooms is perfectly in sync with great sound. High Resolution & Compressed Music Formats: The HEOS Link (HS2) wireless preamplifier supports compatibility with high-resolution audio files for the ultimate listening experience over network (DLNA) or USB (MSC), all in the convenience of your home. Listen to uncompressed WAV (PCM), ALAC (Apple Lossless Audio Codec), and FLAC (Free Lossless Audio Codec) music files up to 24-bit/192-kHz. HEOS is also compatible with compressed music files; such as MP3, WMA, and AAC (MPEG4). USB Port: The HEOS Link (HS2) is fitted with a rear-panel USB (type-A) port that allows you to enjoy a variety of high-resolution and compressed music files from a USB mass storage class memory device, such as a USB thumbdrive (formatted in FAT 16/32). You'll be able to control your USB device's music and view song/artist info from the HEOS app on your Apple iOS or Android device. USB portable audio devices that can be charged via USB will be charged when plugged into the preamplifer's USB port (5V/1A); even in standby mode. USB audio can be distributed other HEOS products connected to your home network. DLNA Certified: The HEOS Link (HS2) wireless preamp is DLNA (Digital Living Network Alliance) 1.5 and Windows 7/8 compliant. This allows you to wirelessly stream a variety of high-resolution and compressed music files stored on your network connected Windows PC or DLNA-certified NAS drives to the HEOS Link (HS2). From the HEOS app on your Apple iOS or Android device you can browse music files, control playback and view song/artist information with album art. DLNA music content can be distributed to other HEOS products connected to your home network. Mobile Device Streaming: Using the HEOS app on your Apple iOS or Android device, you are able to stream your mobile device's music library to the HEOS Link (HS2) preamplifier. You'll be able to browse your music library by Artist, Album, Genre, and Song; control music playback functions like Play/Pause and Previous/Next Track; and view song/artist info with Album Art from the app on your compatible mobile device. You can even type in an artist name or song title to find music in your mobile device's library. Your device's music library can be distributed to other HEOS products connected to your home network. Bluetooth Music Streaming: The HEOS Link (HS2) offers built-in Bluetooth, so you can wirelessly stream stored music and music apps from your smartphone, tablet, computer, or laptop to the wireless preamplifier. You will continue to control music playback and view song/artist information from your Bluetooth-enabled source device. You can stream directly to HEOS Link (HS2) preamplifier, as well as distribute the Bluetooth audio signal to other HEOS products over the network. Analog & Digital Inputs: The HEOS Link (HS2) features a stereo RCA input and stereo minijack audio input to connect two external analog devices. It is also fitted with an optical (toslink) digital input for connection of an external digital device. The optical digital input supports 2-channel, 32-192kHz, 16/20/24-bit audio. The analog & Digital inputs can be distributed to other HEOS products via the network. Note: Your compatible Denon or Marantz AV receiver only allows one IP connection for control. If the receiver is already being controlled by a 3rd party control system via IP, then the HEOS Link (HS2) will not be able to control it. IR Output: Connect the included infrared emitter to the HEOS Link (HS2) preamp's IR output and place it so that it's near the front-panel of your integrated amplifier or receiver. 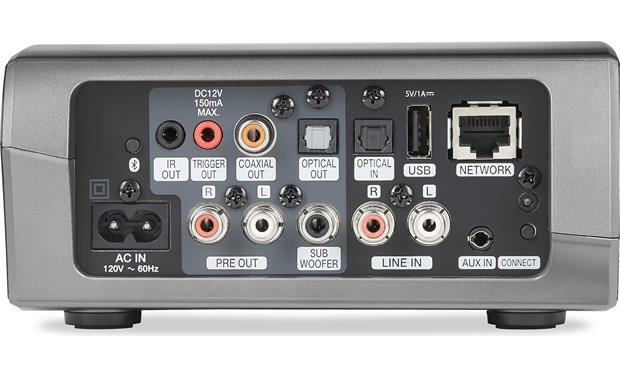 Or, if your AV receiver or amplifier has a direct IR input jack, you can connect the HEOS Link (HS2) via the supplied IR direct cable. 12-Volt Trigger: There's also a 12V trigger output that lets you connect the HEOS Link (HS2) to other devices or products that feature a 12V trigger input, like your integrated amplifier or receiver. AC Power + Power Modes: The HEOS Link (HS2) operates off of standard household current using its built-in power supply (100-240V) and detachable AC power cord. The preamplifier offers 3 power modes. Quick Start: To save power, the preamplifier will automatically enter "Quick Start Mode" whenever there is no network access or playback for 20 minutes and will automatically resume to full power whenever the speaker is selected and playing music. There is no visible indicator or LED that will show that the speaker is in Quick Start mode as it is a fully automatic function. Deep Standby: The preamplifier also has the ability to automatically enter "Deep Standby" whenever the wired or wireless network connection is removed for more than 60 minutes. The front panel LED will turn off during Deep Standby. To "wake" a speaker from Deep Standby, you must press the volume or mute buttons which will immediately turn on the front panel LED. Off: To completely turn off the power to the speaker you must remove the mains plug from the back of the preamplifier. Firmware Updates: Firmware and software updates from HEOS are delivered to the HEOS Link (HS2) via your home network's Internet connection. When such updates become available, you will be notified when you open the HEOS app on your Apple iOS or Android device. I have a HEOS LINK and a Marantz NA6006 and they both work well. If your other components can benefit from a higher quality DAC then the DNP-800 might be better but the decision is really based upon your source, amp and speakers. I'm sorry, I don't really know the answer to your question. I have a Denon receiver with HEOS and I use it to play a hard drive with approximately 50,000 songs on it. I only use it in one room. Sorry, I'm sure that's not much help to you.Enter an answer to this question. Why can't I use this device without internet access or use my internet from my phone? The HEOS system uses your home's network (wired Ethernet or Wi-Fi 802.11 a/b/g/n/ac) in order to access streaming music services, internet radio, or your own music collection. For more details or to discuss further, please feel free to contact an Advisor directly by phone (888.955.6000) or online chat. Thanks! Any update on the HEOS - Amazon Alexa integration release? Waiting to be sure they deliver before investing. I'm afraid we haven't heard any recent updates from Denon about when HEOS' Alexa integration features are expected to be released. Please feel free to check back with us in the near future for any updates. Searches related to the Denon HEOS Link Wireless music streamer with Wi-Fi® and Bluetooth®.